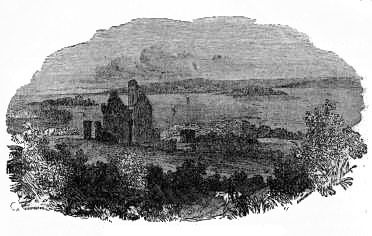 Accession of King James—Joy of the Irish Catholics—Their Disappointment—Bishops, Priests, and Laity imprisoned for the Faith—Paul V. encourages the Catholics to Constancy—Plot to entrap O'Neill and O'Donnell—Flight of the Earls—Ulster is left to the Mercy of the English Nation—The Plantation commences—Chichester's Parliament, and how he obtained Members—Death of James I., and Accession of Charles—The Hopes of the Catholics are raised again—They offer a large sum of Money to obtain "Graces"—It is accepted, and the "Graces" are treacherously refused—The Plantation of Connaught—How Obedience was enforced and Resistance punished—Conspiracy to seize Dublin—Sir Phelim O'Neill—Massacre of Island Magee. REAT was the joy of the Irish nation when James the First of England and the Sixth of Scotland ascended the throne. The people supposed him to be a Catholic in heart, and a prince in feeling. They should have judged less favourably of one who could see his mother sacrificed without making one real effort to avert her doom. His weakness, obstinacy, and duplicity, helped to prepare the way for the terrible convulsion of English society, whose origin was the great religious schism, which, by lessening national respect for the altar, undermined national respect for the throne. The Irish Catholics, only too ready to rejoice in the faintest gleam of hope, took possession of their own churches, and hoped they might practise their religion openly. The Cathedral of Limerick was re-dedicated by Richard Arthur, the Cathedral of Cork and Cloyne by Robert Urigh, the Metropolitan Church of Cashel by Thomas Rachtar, the churches of Wexford by John Coppinger. Dr. White restored himself the churches of Clonmel, Kilkenny, and Ross, and other clergymen acted in like manner in other places. But the most open and remarkable manifestation of devotion to the old faith was in Cork, always famous for its Catholicity, for the generosity of its people, and their special devotion to literature and religion. All the Protestant Bibles and Prayer-books were publicly and solemnly burned, the churches were hallowed, and Smith says: "They had a person named a Legate from the Pope [Dr. Moran, who quotes this passage, supposes him to have been a Vicar-Apostolic], who went about in procession with a cross, and forced people to reverence it. They buried the dead with the Catholic ceremonies; and numbers took the sacrament to defend that religion with their lives and fortunes." But the Catholics were soon undeceived. King James drank "to the eternal damnation of the Papists" solemnly at a public dinner, no doubt to convince the sceptical of his Protestantism; and he divided his time very equally between persecuting the Puritans and the Catholics, when not occupied with his pleasures or quarrelling with his Parliament. The Puritans, however, had the advantage; popular opinion in England was on their side; they were sufficiently wealthy to emigrate if they pleased: while the Catholics were not only unpopular, but hated, and utterly impoverished by repeated fines and exactions. Fortunes.—Smith's History of Kerry, vol. ii. p. 97. Papists.—Oliver's Collections, quoted by Dr. Moran, p. 250.